Most E&P professionals are familiar with aspects of geochemical analysis. But why is a science that could save exploration and production companies millions of dollars and months of drilling time not an industry standard? Geochemical analyses like GC usually only require a few grams of rock or millilitres of fluid samples. Source: Stratochem Services Source: Stratochem Services In 2008, Petrohawk of Houston made the now historic Texas Eagle Ford shale discovery after consulting geochemical data from a nearly forgotten 50-year-old wellbore. The basic 1950s geochemistry confirmed sufficient organic content and maturity in the unusual formation and Petrohawk moved ahead, finding a field it is now estimated will produce between 3 and 4.8 Bbo. As petroleum exploration and production becomes ever more complex, more companies are finding that geochemistry makes the difference for success. At heart, petroleum geochemistry is the application of chemical analysis to determine the presence and properties of hydrocarbons trapped in geological formations or the potential to generate such hydrocarbons. But like most simple definitions, this leaves much unsaid. While geophysics has long been considered the go-to tool of upstream geoscience, geochemistry has become increasingly important as hydrocarbons become more difficult to discover and recover, requiring ever more precise forms of analysis to differentiate between a viable prospect and a dry hole in the making. Like many game-changing technologies, geochemistry is not a new science. As early as 1838, chemist Christian Friedrich Schonbein proposed that chemistry might be used to further geological understanding, but it was not until the early twentieth-century work of Alfred E. Treibs in Germany and Victor Goldschmidt in Switzerland that the geochemistry and organic geochemistry we now use for hydrocarbon exploration came into their own as a scientific discipline. Nonetheless, technological limitations and imprecise understanding of the organic chemistry of hydrocarbons kept the discipline largely out of use until later in the twentieth century. “When things did not work out correctly or dry holes were drilled, the geochemical data were often blamed,” explains Dr. Henry Halpern, a former geochemical consultant at Saudi Aramco with over thirty years’ experience in the field. Indeed, only recently has geochemistry gone from relative obscurity to become a vital part of the exploration process. What makes geochemistry so valuable is its capacity to tease out highly specific information about the characteristics of a petroleum system from just a few rock, oil or gas samples. Like a missing puzzle piece, the various applications of geochemistry allow explorationists to fill in the holes that inevitably appear in even the highest quality geological and geophysical data. The best-established geochemical services revolve around the chemical analysis of source rocks for the presence of hydrocarbons. For decades, geochemists have been able to tell explorationists whether they have a viable source rock with sufficient organic charge, and, if so, its maturity and type, simply by analysing the cuttings brought to the surface as a regular by-product of drilling. Today, precise well-site and laboratory geochemical analyses can quickly, cheaply and accurately reveal a range of information about the origins and prospects of rock, oil and gas samples for exploration and production purposes alike. The applications can be simple, but in the hands of a knowledgeable geochemist, the results can prevent tens of millions of dollars from getting spent in the wrong places. 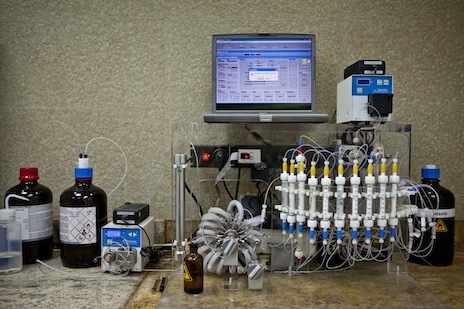 Gas chromatography (GC) is a typical example. A basic chemical analysis used for everything from drug testing to cosmetics quality control, GC can parse out the components of an oil sample with great accuracy. The resulting chromatogram – a peaked graph showing the unique pattern of molecular abundances making up any given oil – serves as a fingerprint which a geochemist can use to identify and compare to other oils. By comparing the presence and ratios of various components, multiple oils can be correlated to their respective sources. Geochemical analysis of oil and gas can be used to characterise wells and basins, revealing information that is very difficult to determine using other methods. Source: Stratochem Services The possible applications are vast, and all for a tiny fraction of the cost of a day’s drilling. Beyond the characterisation of oils for the purpose of connecting them to their sources in exploration, the technique can be used in a reservoir continuity study which assesses GCs of samples from multiple wells suspected of accessing the same reservoir. If a comparison of two chromatograms shows significant differences in the ratios of certain components, the wells from which the oils derive are probably not in communication, perhaps due to unseen geological features creating reservoir compartments. If part of a field’s productivity is declining and the production company is considering well injection or downdip waterflooding, a reservoir continuity study will establish the option’s viability for repressurising the entire system long before injection even begins. “Without the geochemistry… we would have moved ahead and started injection only to find out in three to five years’ time the waterflood wasn’t working and would have had to abandon our investment,” said one reservoir geologist working for an upstream company in North America. The geochemical continuity study costs far less than any other reservoir engineering tests in direct expenditures, and yet even bigger savings come from the opportunity costs avoided. The geochemical method of reservoir continuity determination requires only a representative oil sample from each zone – no wells need be shut down to assess continuity. By a similar process of comparing oil signatures, GC can also be used to allocate and monitor production in wells with multiple pay-zones without costly stops to production. Spectrum Geophysical recently began offering their clients a new basin model study of the offshore Levantine basin that employs, for the first time, a full spread of geochemical analyses to more accurately predict the best approaches to the basin’s petroleum systems. Source: Stratochem Services By linking a GC with other instruments, geochemists can glean even greater information from rock, oil and gas samples. For rock samples, the hydrocarbons inside can be extracted either by a solvent or – for samples that require utmost precision –by a closed-system thermal extractor (a device similar to a pyrolyzer). The extracted hydrocarbons can now be run through the same instruments (i.e., the GC) as oil samples to compare oil and source profiles, allowing explorationists or development geologists to correlate oil and source rocks that may be geographically quite distant. 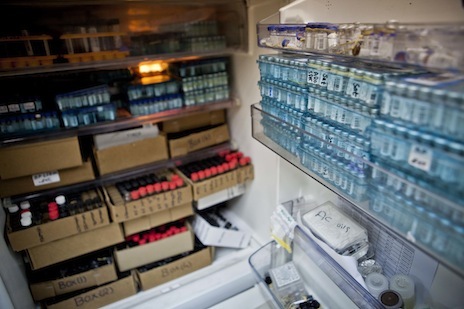 Rock extracts and oil samples can also be analysed in further detail by combining the GC with mass spectrometry (GC-MS). This instrument measures the abundances of various organic compounds called biomarkers to reveal details about the original organic material that produced the hydrocarbons, the depositional environment, the source rock lithology, and the age and maturity of the oil. Dr. Halpern explains: “Certain biomarkers…are useful for oil-source and oil-oil correlations and can lead to new discoveries by mapping distribution and migration pathways.” The same principles hold true for gas analyses using a combination of GC and isotope ratio MS technology that examine the isotopes of natural gas to assess maturity and origin of gases. The kinetics technique to which Waples refers is a personal speciality. Source rock kinetics has long been a part of the geochemical arsenal; by heating a rock sample at several different rates and mathematically analysing the rate of pyrolysis, kinetic parameters can be obtained that can be used to predict hydrocarbon generation in basin modelling studies. In the past, the costs associated with kinetics meant that analysis of many samples was an impractical, prohibitively expensive, time-consuming process. Waples, however, realised that the laws of thermodynamics permit one to estimate one of the kinetic parameters (the A factor) more accurately than the pyrolysis experiments could. Once the A factor had been determined, there was no need for different heating rates. This has the effective result that twenty times more data can now be generated at the same cost, in the same time, as the old method. The large amount of additional data in turn allows kinetic parameters to be employed for other very valuable purposes: distinguishing different organofacies, and as a new indicator of thermal history that is directly linked to hydrocarbon generation. Medium pressure liquid chromatography (MPLC) is a technique for the separation of oil samples into their component parts based on the shapes of the molecules. Analysis of these components enables a deeper understanding of the oil’s characteristics and the geological factors that led to its generation. Source: Stratochem Services Perhaps the most powerful application of geochemistry is when a range of geochemical inputs taken from oil and gas information as well as source rock kinetics are combined with existing seismic and geological information to create a full basin model with precise migration pathways and source rock and reservoir locations. Waples tells of one instance when this combination of geochemical data was crucial to a company’s decision-making. “In one study the kinetic data indicated that the source rock at the studied location was too immature to have sourced the discovered hydrocarbons, which had previously been assumed to have been locally generated. Biomarker analysis of stained and unstained samples confirmed that the hydrocarbon stains were indeed significantly more mature than the unstained host rock, and thus indicated migration of significant distance from the kitchen.” The company pivoted away from an exploration plan of unconventional fraccing to one geared more toward a conventional play. 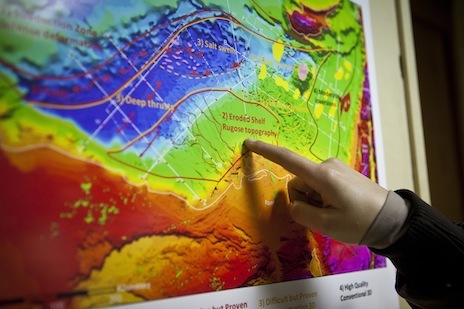 Combining geochemical data with a company’s geological and geophysical data through the use of powerful software allows explorationists to see where there is an actual hydrocarbon ‘charge’ in the structures indicated by their seismic. “A good charge model is the first requirement for successful exploration. It is the driving force behind the subsequent activities which focus on risk reduction of reservoir and structure or trap,” explains Neil Hodgson, New Ventures Manager with Spectrum Geophysical. But given the obvious utility of geochemistry, why has it only begun to see wider use recently? Careful preparation of samples, including extraction of unwanted organic matter, mud additives or well-site contaminants, is often necessary to achieve the most accurate possible geochemical analyses. Source: Stratochem Services The recent rise of geochemistry is part of the larger economic story of the explosive growth of the oil and gas service sector. Consistently high oil prices combined with technological breakthroughs in liquid natural gas and unconventional shales have created huge demand for exploration, fuelling the growth of exploration service companies. The Canadian Imperial Bank of Commerce calculates the petroleum service industry’s annualised growth rate to have reached nearly 10% over the past five years. True, in hard financial terms, even the revenue from top service sector players like Schlumberger, Halliburton, Baker-Hughes and Weatherford makes up a bare fraction of the whole multi-trillion dollar petroleum industry – and geochemistry forms just a sliver of that fraction. But that sliver shows signs of growing faster than the pie. Even as industry economics have created new demand for geochemistry, advances in the science continue to create new possibilities. “With the advent of better and better means of analysis and greatly reduced levels of detection limits, all analytical data are better today than even five years ago,” says Halpern. Still, Halpern and his fellow geochemists remain convinced that geochemistry is a discipline on the rise. “I find that most companies realise there is a need for geochemical data nowadays,” he affirms. Hodgson, too, sees a central role for geochemistry: “[I]ntegrated geochemistry can be considered…the keystone of exploration: at the heart of – and gluing together – the raft of activities in the exploration/value creation process.” And exploration companies like Petrohawk in Texas seem to agree. Once the dark horse of the geosciences, geochemistry is surging forward throughout the upstream sector. From basic source rock characterisation and oil GC correlations to full basin modelling studies, gas isotope analysis and one-run kinetics data, explorationists who once mistrusted geochemistry now increasingly depend on it to make the right exploration decisions without blowing their budgets. As projects get more complicated and costly, geochemistry may just be the horse that keeps the whole race going. 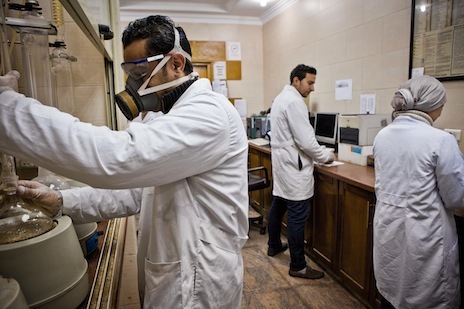 StratoChem Services, the largest independent geochemical testing company in the Middle East and North Africa, was founded in 1989 by two experienced Egyptian geoscientists, Mohamed Said and Tarek El-Azhary. 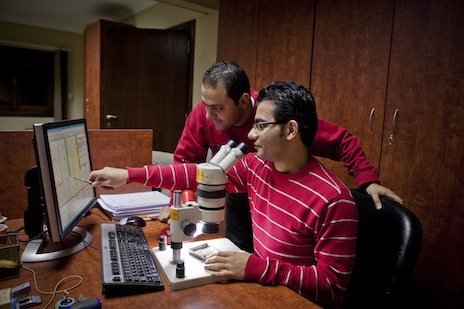 The pair met as geology students at Cairo University, but remained close friends after graduation. After years of worldwide experience working in the petroleum industry, Said and El-Azhary realised the oil and gas sector in their home country consistently spent a great deal of money on exploration projects that utilised incomplete information. Knowing that even simple geochemical analyses could reveal previously undiscovered resources, the pair decided to provide the missing services themselves. 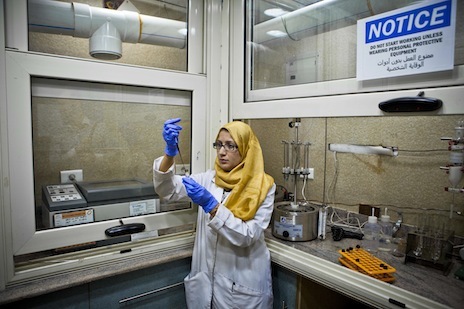 Started with just personal savings, a small lab in Cairo, and a mechanical engineer, StratoChem has grown into a world-class provider of petroleum analysis and interpretation with over 70 employees. StratoChem now serves upstream companies in North America, Europe, Africa, and the Middle East, offering a broad capacity for rock, oil, and gas analysis that includes everything from basic TOC and oil GC, to mud gas isotope logging, one-run personalised kinetics, and full, 3D basin modelling. Reducing costs and risks of deepwater hydrocarbon exploration: the benefits and technology of seep hunting and surface geochemical campaigns. The companies that lead the next wave of exploration will be those that concentrate their time on analysis and not on data acquisition.